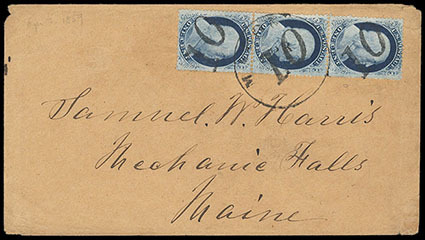 1857, 1¢ blue, type V, vertical strip of three, each struck with Numeral "10" handstamps on cover to Maine, additionally tied by indistinct cds, Very Fine and unusual; with 2016 P.F. certificate. Scott No. 24 Estimate $600 - 800. 1857, 1¢ blue, type V, horizontal pair with s.e. 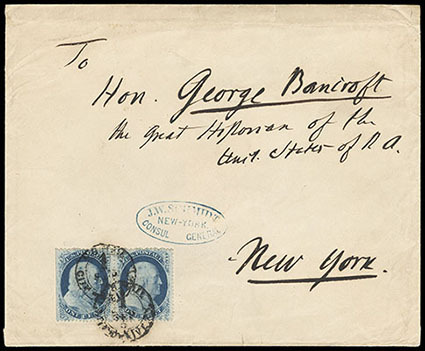 at left, tied by two strikes of the small double-circle New York City Delivery cds on square envelope addressed to "Hon. George Bancroft, the Great Historian of the Unit. States of N. A. ", neat blue oval consular sender's cachet, the left stamp with natural straight edge at left, Very Fine, a nice example of the combined carrier and drop rates. Scott No. 24 Estimate $300 - 400. The addressee, founder of the United States Naval Academy, Secretary of the Navy, Ambassador to Great Britain and to Spain, was the pre-eminent American historian of the 19th century. His massive multi-volume History of the United States is still a basic reference today. While the sender's address may have been rather flowery, it hardly overstated the case. 1857, 3¢ dull red, type III, tied by "Cleveland O. Jul 23, 1860" cds on cover with spectacular Abraham Lincoln and Hannibal Hamlin campaign cover to Des Moines Iowa; design shows beardless Lincoln portrait design with "The Cold Water Candidate" heading and additional overprinting "Temperance and Freedom" advertising on face by "The Analyst" newspaper weekly of Cleveland Oh., flap with additional subscription info, minor flap opening tear, Very Fine and choice; with 2019 P.F. certificate. Milgram No. AL-36 var. Scott No. 26 Estimate $5,000 - 7,500. 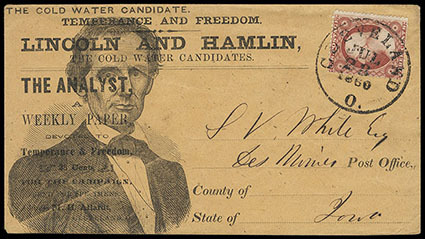 AN EXCEPTIONAL EXAMPLE OF THIS RARE LINCOLN AND HAMLIN "THE COLDWATER CANDIDATE" 1860 CAMPAIGN DESIGN OVERPRINTED WITH TEMPERANCE AND FREEDOM CAMPAIGN SENTIMENTS. Temperance advocates embraced Lincoln as their choice for president in the 1860 election, naming him the "Cold Water" candidate. Envelope designs using this temperance theme are rare, and they were all published by M. H. Allardt of Cleveland. 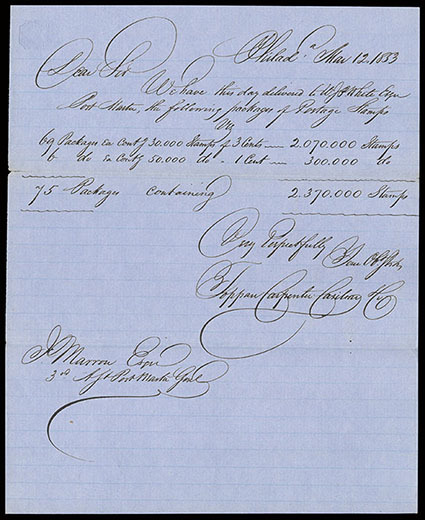 The Analyst newspaper was started in 1858 by J. A. Spencer, who apparently sold it to M. H. Allardt before 1860. Including this cover, we are aware of only four examples of the AL-36 design, but no other examples with the additional temperance overprint on face. 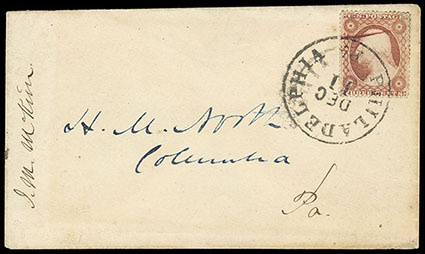 1857, 3¢ dull red, type III, cracked plate, position 71L18, intermediate stage of crack extending into top right vignette, tied by "Philadelphia, Pa., Dec 11" cds on cover to Columbia, Pa., 1857 docketing on reverse, Very Fine, early stages of this crack do not extend into rosette with later stages extending across and beyond design; with 2012 P.F. certificate. Scott No. 26 var. Estimate $500 - 750. 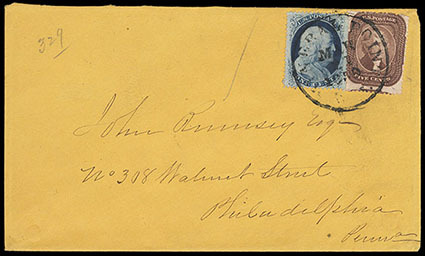 1859, 5¢ brown, type I, in combination with 1857, 1¢ blue, type V (24) on fresh double rate cover to Philadelphia, Pa., tied by "Mineral Point, Mar 21, 1859" cds, Very Fine, a very scarce domestic double rate combination and the Earliest Documented Usage of the 1859 5¢ Brown Type I Issue; with 1999 A.P.S. certificate. Scott No. 29 Estimate $500 - 750. 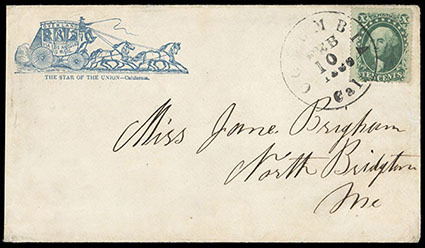 1859, 5¢ brown, type I, vertical pair, in combination with 1859, 10¢ green, type V, vertical strip of three on cover addressed to the U.S. Frigate "Congress" in Rio Janeiro, Brazil, all tied by "New Orleans, La., Aug 18, 1859" cds's, magenta manuscript ratings and reverse with "New York, Am. Pkt., Aug 27" exchange cds; stamps scissor separated and bottom 5¢ with flaws from cover overlap, Very Fine appearance. Scott No. 29+35 Estimate $250 - 350. 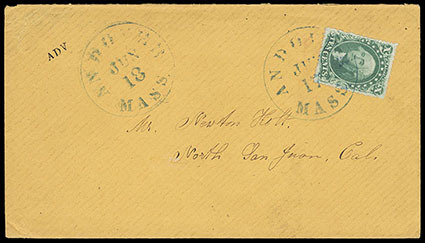 1857, 10¢ green, type III, nicely centered, tied by blue "Andover, Mass., Jun 18" cds on fresh cover to California, with second strike of cds and small "ADV" advertising handstamp of North San Juan, Cal. Very Fine and choice; with 2004 P.F. certificate. Scott No. 33 Estimate $400 - 600. 1859, 10¢ green, type V, tied by Columbia, Cal. Feb. 10, 1860 cds on neat cover to Maine with lovely blue illustration of "Overland Via Los Angeles, US Mail" Four Horse Stagecoach design with "The Star of the Union - California" imprint below, couple of tiny mended edge tears, Very Fine and attractive. Scott No. 35 Estimate $500 - 750. 1857, 12¢ black, plate I, horizontal pair, s.e. 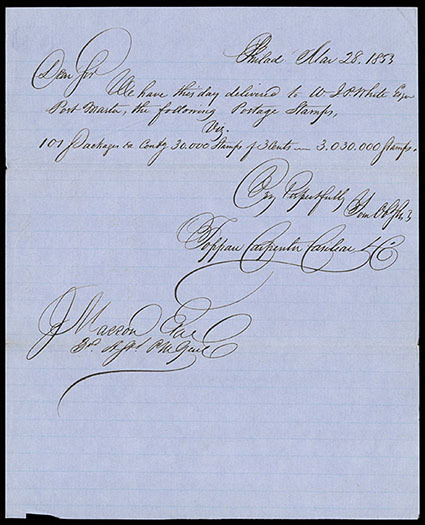 at left, tied by two strikes of an "Augusta, Ga. Jan 27" cds and red New York exchange office "19" credit handstamp on 1859 folded letter to Belfast, Ireland, carried by Cunard Line Europa from New York Feb. 2nd to Liverpool arriving Feb. 14th, red "Paid, Liverpool, Br. 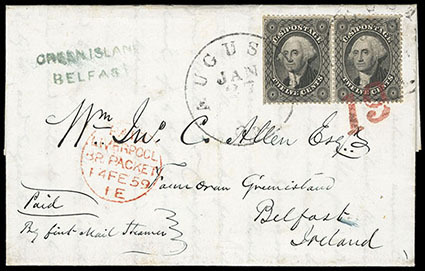 Packet, 14 FE 59" cds, blue-green "Green Island, Belfast" handstamp and matching Belfast (2.16) arrival backstamp, Extremely Fine and choice. Scott No. 36 Estimate $1,000 - 1,500. A BEAUTIFUL 12¢ 1857 ISSUE TREATY-RATE COVER TO IRELAND.